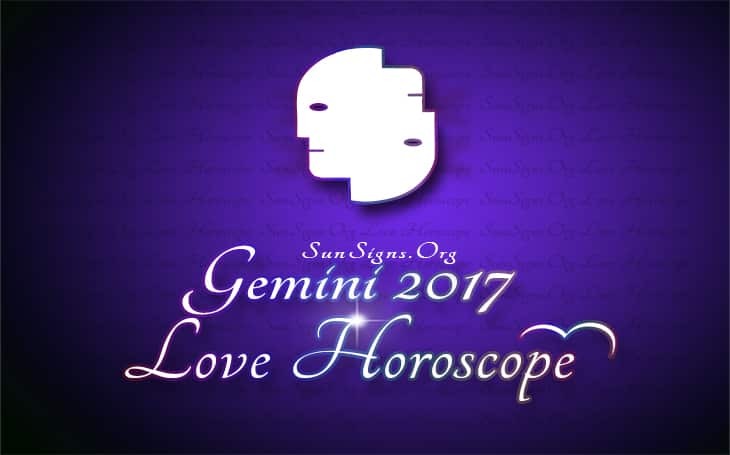 Gemini Love Horoscope 2017 forecasts that the House of Love and Romance, which was dominant for the past few years, will continue to be powerful in 2017. Last year you were socially very much active and were able to get into serious partnerships and even marriage. After April 2017, your social life takes a back seat and you will try to improve your personal relationships. Be it romance or just friendship, the Gemini personality will come out a winner in all their relationships in 2017. You will even be willing to try dating online in your quest to find the perfect soul mate. The love horoscope 2017 for Gemini zodiac sign foretells that single Twins will find love in professional environment and in health centers. You may fall in love with your boss at work or even your doctor. Local neighborhood and financial institutions are other hunting grounds for finding your soul mate in 2017. There will be a commitment in the present love partnerships after April 2017. After August 1st, Jupiter will make the Gemini love compatibility more loving and joyful. The 2017 Gemini love horoscope foretells that you will make serious efforts to understand your spouse or partner. There will be more sexual passion in your love life and ideal romance will not be that prominent. Planning for a child or pregnancy related issues will keep you occupied in 2017. This will be in stark contrast to your focus last year and during the first quarter of 2017. Then the emphasis was on making new romantic affiliations and getting into marital bond. You were also interested in making new friends and enlarging your social network. Divorced Gemini zodiac sign looking for new alliances will be successful in finding their mates out of the blue and all of a sudden. They may find love in intelligent personalities who are likely to be eccentric and exceptional. Friends and social contacts will be helpful in finding the right partner. Gemini individuals looking for a third marriage will be less active socially this year. They may find a love mate who is senior, dominating, loyal and caring. The relationship will be on trial till some clarity emerges after the solar eclipse of April, 17th 2017. The Gemini 2017 love astrology predicts that children of marriageable age should be ready to face major changes to their lives this year. Children who are already married will face some volatility in their marriages after April. Those children who are yet to be married will be attracted towards an old flame or a senior person. They are looking for commitment and stability in their relationships, and it may be quite difficult to find these in the new relationships. Overall, the Gemini love horoscope 2017 foretells that you will have an exciting and adventurous year when it comes to love and romance.